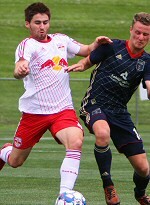 New York Red Bulls II earned their first road point since May, drawing Bethlehem Steel, 2-2, on Wednesday night at Goodman Stadium in Bethlehem, Pennsylvania. With the road draw, NYRB II moved into a three-way tie for sixth in the Eastern Conference with Indy Eleven and Charleston Battery at 21 points. Stefano Bonomo, wearing the captain's armband, got the scoring started in the 12th minute by finishing off a penalty earned by Ben Mines. Bonomo doubled his tally in the 66th, scoring his third goal of the season. Bonomo, who led NYRB II in scoring last season, tallied his first brace of 2018. Bethlehem rallied late to earn the draw, with Matt Mahoney scoring in the 88th minute and James Chambers finding the equalizer with the last kick of the game.